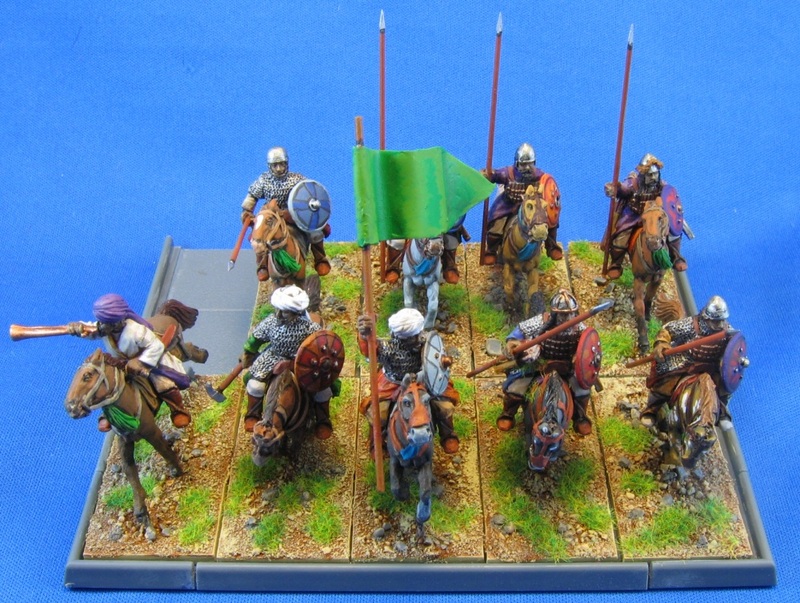 Arab Cavalry for my Caliphate WAB army. If I may say so, I’m rather pleased with the results. 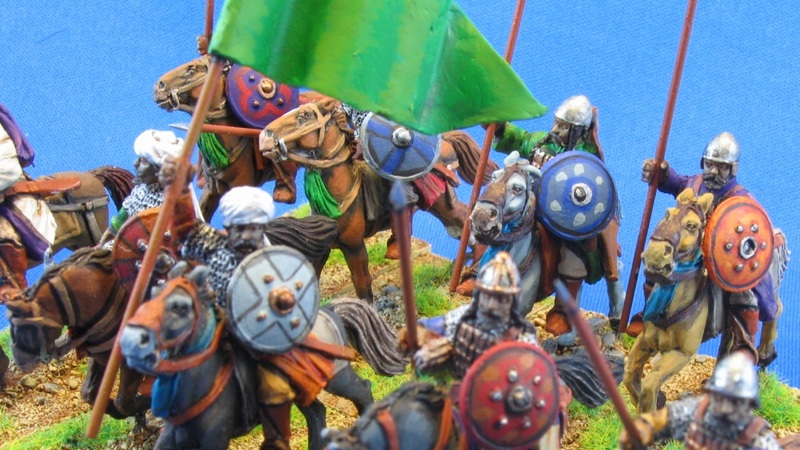 Strong highlights in saturated colors allow the figures to stand up well on the table top. Heavy use of GW washes and a bit of black lining add definition to the figure. The shields even have a touch of free hand work (hardly Golden Demon work, but its the most I’ve done in years). 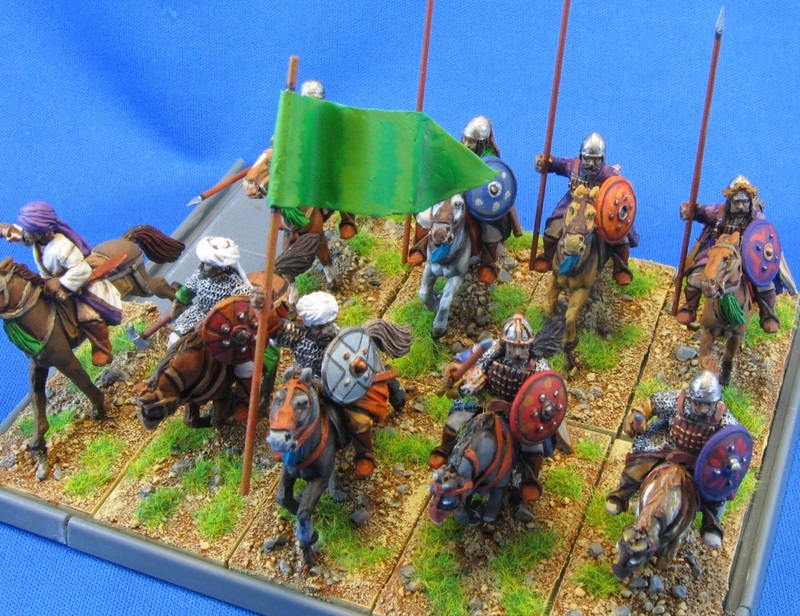 The unit took about a month to complete – don’t know what it is about horsemen that take forever to paint. Models by Perry Brothers Miniatures purchased via The War Store. Its been 2 years(!) since my last quest for spray primer. One can of Plasti-Kote White was good for about 250 figures. Great stuff – covered both metal and plastic, with no flaking and did not hide any detail. Now the can is empty & the product no longer seems to exist. Going back to my original research Dupli-color automotive primer seems to be the next best product. What is everyone using to prime their figures? I always prime white, work with metal and plastic figures, and would like to avoid spray paint. Dupli-color sandable primer is a hit. $5.00 at the local auto parts store will take care of my primer needs. The test figure turned out great. The metal fig showed off flash lines & minor details I missed when first cleaned & the plastic figures (Wargames Factory and Mantic) have a smooth base coat with no melting or bending.